The European Union will not be hostage to a "political crisis" in the UK, France's president has said. 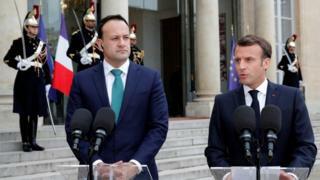 Emmanuel Macron was speaking in Paris during talks with Irish PM Leo Varadkar. "We will never abandon Ireland or the Irish people no matter what happens, because this solidarity is the very purpose of the European project," said Mr Macron. Mr Varadkar said any Brexit extension needed "a clear purpose, clear plan". Their meeting came after MPs twice rejected Theresa May's Brexit withdrawal deal, with the government now ramping up plans for a no-deal scenario. Mr Varadkar said he would also discuss the Republic of Ireland's no-deal plans with Mr Macron. The taoiseach (Irish prime minister) emphasised that the EU should be open to any "credible proposals" the UK put forward about in the Brexit process. What does a soft Brexit mean? Mr Macron told reporters that France and Ireland would be the countries most affected by a no-deal outcome. They both said the integrity of the single market would need to be protected, but that the EU would uphold commitments made to ensure the protection of the Good Friday Agreement. Mr Varadkar's visit to France comes ahead of German Chancellor Angela Merkel's trip to Dublin on Thursday. He said the EU would need to seriously consider how to respond to any request from the UK for a longer extension, in order to avoid leaving with no deal on 12 April. Mr Varadkar said that it would come with conditions, requiring the UK to take part in European elections on 23 May. Mairead McGuinness, vice-president of the European Parliament and Fine Gael MEP, said that a no deal does not solve problems for those who would advocate for a hard Brexit. "There's a view that a no deal would be a forever state of play from those that would argue for it, but frankly it's not," she said. "Immediately afterwards I believe the UK would need to come to the EU and ask to speak and negotiate." Mr Varadkar is expected to return from Paris on Tuesday evening and hold a meeting of his cabinet. Earlier on Tuesday, Michel Barnier, the EU's chief negotiator, said a no-deal Brexit is now more likely but can still be avoided. The Democratic Unionist Party (DUP) voted against all four options tabled on Monday. The party's deputy leader Nigel Dodds said if the Irish border backstop was addressed, the DUP could "do business" with the government. Speaking after the indicative votes, Mr Dodds said the only proposition that MPs had ever supported was an amendment - known as the Brady amendment - calling on the government to negotiate changes to the backstop. The backstop is the insurance policy to maintain an open border on the island of Ireland, unless and until another solution is found. The DUP and some Brexiteer MPs oppose it because if it took effect, it would keep Northern Ireland only tied to some EU regulatory rules, and would keep the whole of the UK in a customs union with the EU. On Monday night, independent unionist MP for North Down, Lady Hermon, backed two of the options. She voted for another referendum and to revoke article 50, but against a customs union or single market arrangement. German Chancellor Angela Merkel will visit Dublin on Thursday, as pressure mounts over Parliament's failure to ratify the withdrawal agreement. The UK is scheduled to leave the EU on 12 April, if it cannot propose a way forward to the EU. An extraordinary EU summit is due to take place on 10 April. Mr Varadkar said he would discuss with his French and German counterparts how the European Council should respond to a request for another extension from the UK, to seek a delay to the Brexit process. Which options could tackle border? Brexit: Would no deal mean the return of direct rule?